Some boat wrap projects can be trickier than others. For example, what do you do when you have large antennae or radar equipment sticking out from the top and sides of a boat? How do you ensure a tight seal so that your boat is protected when the winter weather hits? We've got you covered today. First off, we used our 7 mil shrink wrap to protect this boat. It's made of 100% virgin resin with 12-month UVI protection. It also is the most commonly used millage when it comes to recreational and personal boat protection. Next, we tackled the installation. We accommodated some of the antennae by pulling the film into place and then seeing where the wrap wanted to fall on the base of the antennae. We then made a hole for the antennae to pass through and pulled the film back to slide the antennae through the holes. This method supplies a decent, but often loose fit around the antennae. After the film was sitting where it wanted to be, we then applied preservation tape around the hole openings to secure the film to the antennae. Some of the radar equipment and other instrumentation that were on the side of the boat were accommodated by making creative slits in the shrink film. The film was then fused around the instrumentation. This process of accommodation for the antennae should usually happen before film is secured to the perimeter strap. However, the accommodation for the side instrumentation usually happens after the film is secured to the perimeter strap. Another factor to take into account is temperature. It's harder to install a wrap around antennae if temperatures are freezing. Working in gloves and dealing with nearly-frozen tape can be difficult. If you're doing the wrap yourself, avoid trying to wrap in freezing cold temperatures. It may seem like a tough job, but larger boats with antennae and radar can absolutely be wrapped! We supply premium quality 100% virgin resin shrink wrap in varying lengths, widths, and mil thicknesses. 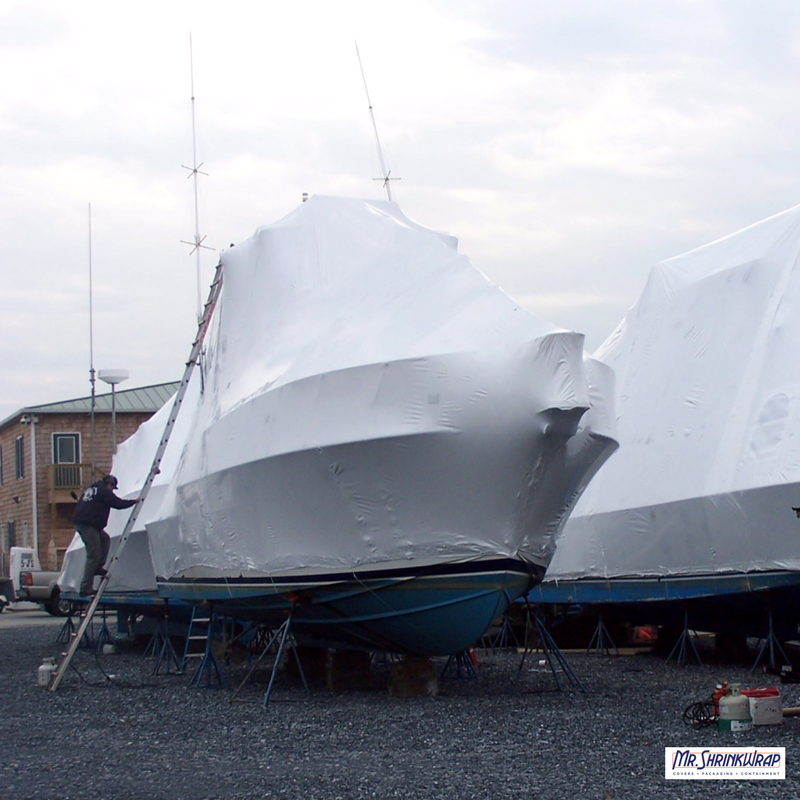 We recommend 6 and 7 mil shrink wrap for boat wraps. More specifically, we recommend 6 mil shrink wrap for boats smaller than 20' long and 7 mil shrink wrap for larger boats.We also supply a full line of installation accessories and everything you need to complete your shrink wrap job, start to finish. In addition to supplying top quality shrink wrapping supplies and equipment worldwide, our Mr. Shrinkwrap team specializes in providing on-site shrink wrap services in a variety of commercial, industrial, residential and agricultural applications. Find out more here. If you’re interested in having us provide on-site shrink wrap services for wrapping your boat, please check out this page for more information.